Gil Hibben IV Machete Knife with Leather Sheath | BUDK.com - Knives & Swords At The Lowest Prices! 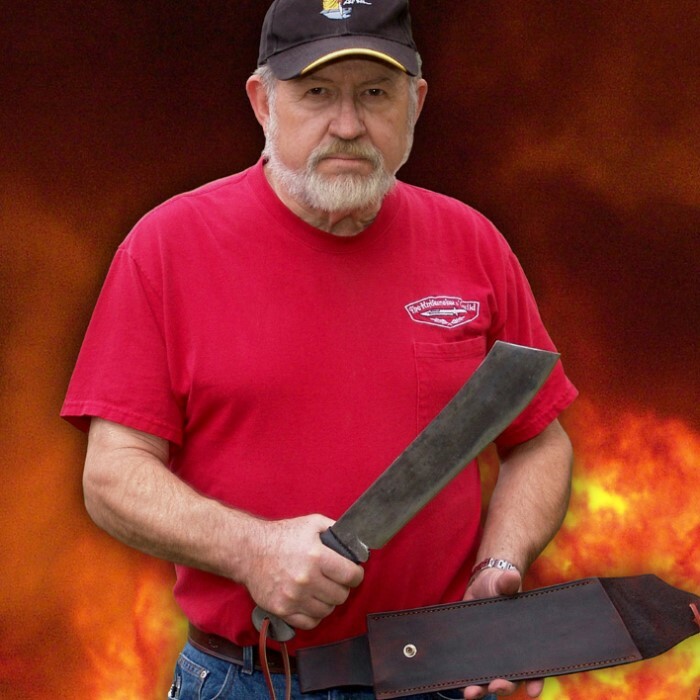 This is a great machete, its dull out the box (duh), and it has a big handle that might be uncomfortable for people with small hands. The cloth wrap will come off and it os NOT a gil hibben. It is a Licensed replica of a hibben design. This thing is a work horse non the less. just got mine and all's I can say is Wow this is one Nice chunk of steel love this Axenife!!! Got mine on one of the % sales. Strong heavy but only some of it was sharp the rest of the edge was like a spoon. The rap was lame replaced it with 550 cord Me and Lansky will work on the edge. This WILL be a great blade. Heavy Strong elongated axe !! Love the heft of it ! I put it on an grinding wheel and ground it to a hook angle that is not only plenty sharp but will hold that edge quite a while! A good file will do the same job, just takes a little longer! This Monster will get the job done!! By the way, if you have to pay to get it sharp you don't belong out in the outdoors. You won't be able to last ! Better stay in that cozy townhouse! I wanted this blade for a few years now and now that I finally got it, and I'd describe this primitive knife as a cross between a machete, cleaver, and a hatchet. The end product is a heavy and solid chunk of steel. In addition, you get a sleek leather sheath and Hibben's certificate of authenticity. The blade isn't the sharpest, but due to it's weight, it'll just crush anything that gets in it's way. This replica does the one Stallone used in the movie maximum justice, right down to the hammer marks and scuffs. Quite possibly the most favorite knife in my collection. I got this machete on sale for $28 and I must say, it is my favorite machete. Its a bid shorter than I expected but is definitely thick and heavy. Seems great for chopping. The sheath is nice quality and fits well. I have 2 complaints about this knife though. One would be the handle wrap is some kind of cheap fabric, and two would be the condition I received it in. Due to the hot weather, the foam from inside the box actually melted onto the handle and will not come off so one side of the handle is solid white. Mine also came with a bit of rust on it as well. Other than that though, this is a great machete even for double what I paid. Have looked at this for a while now. Finally decided to take the plunge and get it. It is strong and solid, very strong quality steel. The finish looks amazing and this is the first piece i got the customized 3 letter thing. I really do like it, i would say for the money if you are looking for similar items why not. I think it has collectors value. Although neither of these things i'm about to mention would deter me from buying it all over again i wanted to note that mine game worse than extremely dull. It had no edge whatsoever. it more resembled a grinded flat edge or cut out of stock metal. Even so, i actually don't mind at all. I get to put my own edge on it, its going to take a lot of work but i want to use this as a hatchet/wood working replacement. The way mine came allows me to remove as much metal as i want and i can get the wt appropriate for me. The 2nd slight downfall is the handle is very tall, comfortably thick and well wrapped with a comfortable leather band, but i have small to medium hands and i can tell if i don't reduce some material in the height of the handle it will get uncomfortable chopping against hardwood. This is ok still to me for similar reasons of being able to reduce metal there and maybe even add some grooves for fingers. I wanted this knife for my collection and when it arrived I was surprised as to how massive this knife was. 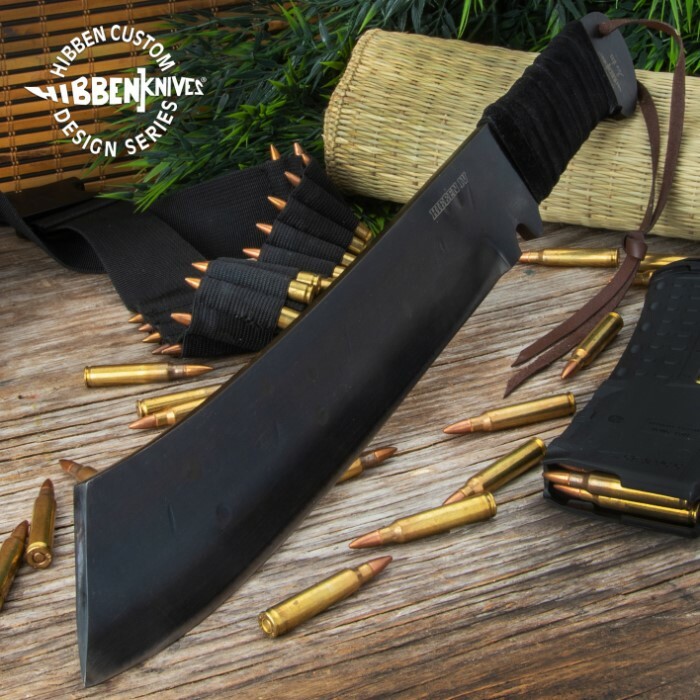 Now i just have to keep on working on my Gil Hibben collection and I just hope the rest of the my knife collection will be as great as this machete. If anybody wants a great knife for a collection or to use for hunting you have to buy this knife and you can't beat the price.